When it comes to how their employees dress, employers say that this is one of their biggest pet peeves; what is it? When it comes to how their employees dress, employers say that un-ironed and wrinkled clothes is one of their biggest fashion pet peeves! Congratulations to Deanna Elleman of Richmond for being the first to correctly answer the Impossible Question! Shockingly, it was found that people in their 50’s are more likely to do this than people in their 20’s; what is it? Shockingly, it was found that people in their 50’s are more likely than people in their 20’s to sleep without clothes on! Congratulations to Dillon White of Hagerstown, IN for being the first to correctly answer the Impossible Question! 19% of all people said they would be more productive and wouldn't goof off at work if they had this; what is it? 19% of all people said they would be more productive and wouldn’t goof off at work if they had a better boss! Congratulations to Miranda Grimm of Richmond for being the first to correctly answer the Impossible Question! Two-thirds of all adults admit that they have a favorite one; what is it? Two-thirds of all adults admit that they have a favorite coffee mug! Congratulations to Lana Bullock of Fountain City, Indiana for being the first to correctly answer the Impossible Question! 15% of all people say they consider this one of the most magical moments of their life; what is it? 15% of all people say that passing their drivers test was one of the most magical moments of their life! 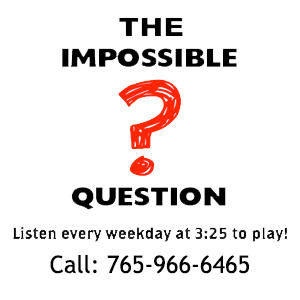 Congratulations to Jimmy Beetem of Centerville, IN for being the first to correctly answer the Impossible Question! The average one has 43 words; what is it? The average handwritten Mother’s Day card has 43 words. Congratulations to Pauline Bolt of Richmond for being the first to correctly answer the Impossible Question! Almost a third of all people, at one time or another, have vowed to be better about this at work ; what is it? Almost a third of all people, at one or another, have vowed to be better at not eating junk food. Congratulations to Nathan Williamson of Economy for being the first to correctly answer the Impossible Question! 39% of all men are OK with their wife or girlfriend doing this; what is it? 39% of all men are OK with their wife or girlfriend belching out loud. Congratulations to Samantha Parker of Connersville, IN for being the first to correctly answer the Impossible Question! 40% of all people have lied to a friend to avoid this; what is it? 40% of all people have lied to a friend to avoid helping them move! Congratulations to Elvis Belt of Connersville, Indiana for being the first to correctly answer the Impossible Question! 15% of all women have broken up with a man because of this; what is it? 15% of all women admit that they have broken up with a man because of his mom! Congratulations to Mandy Adkins of Eaton, OH for being the first to correctly answer the Impossible Question! 20% of all people think it’s perfectly fine to do this every couple days; what is it? 20% of all people think it’s perfectly fine to only change their underwear every couple of days. Congratulations to Melissa Gross of Hollansburg, OH for being the first to correctly answer the Impossible Question!